I woke up this morning to find that my shipment from Mandarake had arrived, containing none other than the lovely Espadia! She's my first Shinki and I love her to bits. I really love the modularity aspect (I've already come up with like 10 alternate armour configurations so far) and the design kicks arse. She's currently displayed wielding her 3 swords combined into one massive pig-sticker and her triskele thing as a shield. There's a few things I don't like: the tiny tiny wrist washers feel like they could very easily break or go missing. Also some of her joints (her torso joint and her wrists especially) are somewhat loose, and her hips aren't as poseable as I'd have liked. All that said though I love her and I look forward to collecting more. I would upload some pics but all I have is the cruddy camera on my PS Vita. Obviously Lancamento is a must buy for the Heracles robot (and also because you can't have one without the other) but what other Shinkis are worth nabbing that aren't super-expensive? For the record, I really enjoy the modularity/armour building aspect, so Shinkis that excel in that regard interest me. First of all, congrats on getting Espadia! Secondly, I know it's not specified in the Show & Tell Rules, but... I think it's not a good idea to start a thread in the Show & Tell section if you don't have any actual photos to share. Just saying. Thirdly, in response to your question as to what other Shinki are worth nabbing that aren't super-expensive? Unfortunately what few Shinki out there who aren't super-expensive are the EX sets like Waffebunny and Waffedolphin who don't come with bodies and the not-so-popular ones like Xiphos and Benio. And it's really hard for me to answer which Shinki that I think are worth nabbing, because the ones I think are worth nabbing may not be worth nabbing to you. You probably don't want any of the Light Armor Shinki -- Partio, Pomock, Harmony Grace and Bright Feather to name some -- as their armor only has one configuration... and you said you're looking for the Shinki that excel in armor building and modularity, so... there's at least four Shinki I recommend getting that don't fit what you're looking for (unless you have plans to customize your Shinki by giving them armor that doesn't come standard on them like what ZeroEdge has done with his). So... my best advice is to just look at every single Shinki that has been released, make yourself a list of all the pros and cons to each Shinki, and then determine the ones that you absolutely must have... and, if necessary, start saving up money for the ones you want that happen to be really expensive. Hmm. Should have thought about that. Well, here's a pic anyway, taken with my PS Vita. I apologize for the potato quality. I just love the unfoldy extendable arm modules- I currently have her displayed with them unfolded and the twin swords attached. 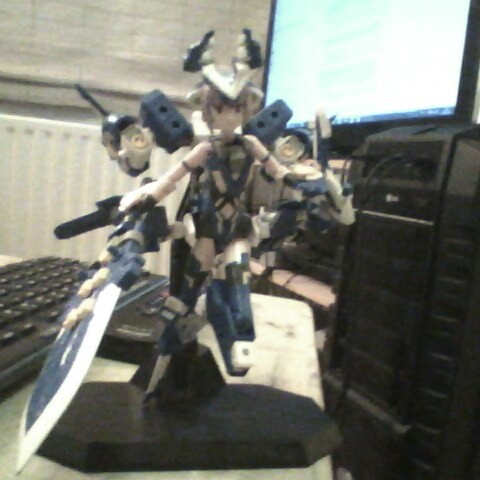 BTW: how good for custom configurations is Howling (including mixing with other Shinki armour parts)? I was considering getting her and the Fort Bragg set once I have more money and mixing and matching the parts for maximum doggy dakka. By strange coincidence, I just posted a bunch of "modded Howling" pics in my thread a couple of days ago...I don't know how much easier than the other Shinkis she is to mod, but her mostly-black-with-some-green color scheme tends to match up with many military parts.